Omega-3 is one of the most highly researched and clinically proven nutrients in the world. Numerous studies reveal that omega-3s are essential to many aspects of health. Omega-3s are well known for their heart benefits as they help lower triglycerides, reduce inflammation, reduce atherosclerosis (hardening of the arteries), and can even help you maintain healthy blood pressure. These are all risk factors of heart disease and according to the American Heart Association people with diabetes often have these conditions. The American Heart Association considers diabetes to be one of the six major controllable risk factors for cardiovascular disease. Because our bodies do not produce omega-3, we must find it in natural food sources or supplement form. These days, omega sources are hard to find. If you are not eating an abundance of fish or other omega-3 enriched foods, you may not be getting the amount of omega-3 that is recommended by the American Heart Association for people who are at risk for heart disease. In addition to heart issues, omega-3s can also help with so many other health complications affecting people with diabetes such as eye problems, joint pain, nerve damage, weight gain and kidney problems. Click here to read more about how omega-3 can help with these complications. 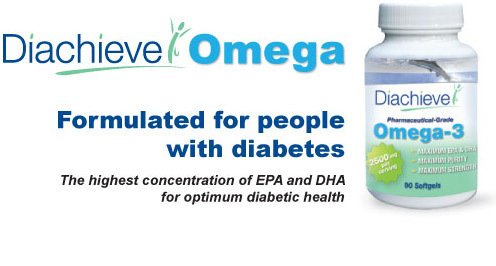 Diachieve Pharmaceutical Grade Omega-3 contains the optimal omega-3 content for people with diabetes. With the highest concentration of the two most important omega-3 fatty acids, EPA and DHA, you know you are getting the ultimate protection. Many other brands contain only a small amount of omega-3 per capsule and you would need to take several capsules just to get the same dose that is in just three capsules of Diachieve Omega-3. Just because the label on a brand of fish oil states 1,000 mg., it doesn't mean it contains 1,000 mg. of omega-3. Most retail brands of fish oil typically contain only 300 mg of omega-3 per softgel. Omega-3 fatty acids are the good fats that are recommended by the American Heart Association and many doctors. Diachieve Omega-3 is pharmaceutical-grade, which means it undergoes the highest purification process available to remove all contaminants such as mercury and PCB’s. Supplements can provide a great source for meeting your omega-3 requirements. 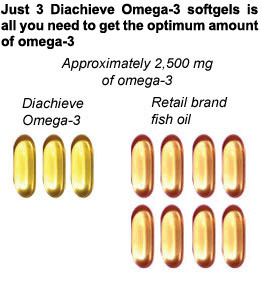 Diachieve is a brand you can trust for the highest potency and purest form of omega-3 available today. Manufactured in an FDA inspected, “A” rated cGMP (Good Manufacturing Practices certified) facility exclusively for ADW Diabetes.